Here we are with latest trick for free recharge for any network. 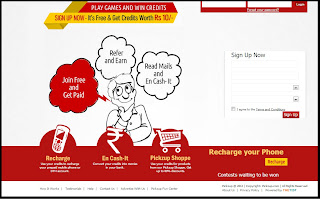 Once you have Signed up, you get instantly creditted with 100 points(10 RS). Then reffer your friends to this site and check their emails. Once your Account reaches 100 Points(10 RS), you can request for a free recharge to your Mobile and the recharge will be done in 2 days/ 48 Hours.